‘Bling in the New Year’ was a huge success! Lots of Funn was had by all. Hope you all have a 2010 that is full of health, happiness & gorgeous interiors. 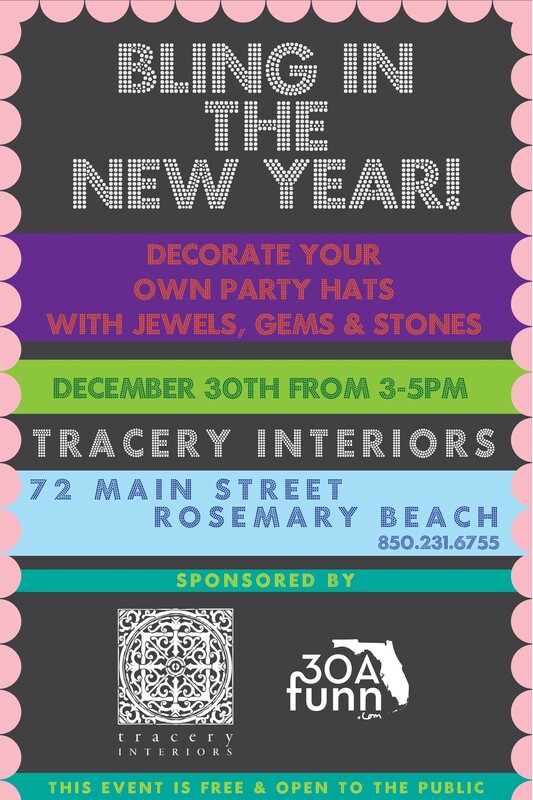 Dont forget to pop in the shop TODAY anytime from 3-5pm to decorate festive party hats for your New Year’s Eve celebration! We are located at 72 Main Street in Rosemary Beach, Florida. Call 850.231.6755 for more information. Free & Open to the Public! Lake Martin, for those of you not from around here, is a weekend getaway destination about an hour and a half south of Birmingham, which also draws a lot of families from Atlanta and Montgomery. It’s a couple hours north of our office in Rosemary Beach, Florida, making it easy for us to reach from either of our locations. In 2009, we were excited to finally break onto the scene at the Lake with three beautiful projects that debuted. Working with Russell Lands, a large development company with historical roots to the area, and our sister company Dungan Nequette Architects, we designed two projects for a new development called Russell Crossroads. The first, Catherine’s Market officially opened at the very end of 2008 but saw its Grand Opening this past spring. The interior of Catherine’s Market is fresh and bright. A classic black and white color scheme is accented with galvanized metal, white enamel and chrome reto-inspired display cases and a cool grey-green accent color painted on sliding cabinet doors above the cases. It was great fun to work with renowned grocers Rick and Lynn Little who manage the Market and also oversee the wonderful V. Richard’s Market in Birmingham. We love the way the Market feels and the public does too–the response has been phenomenal! A couple of months after Catherine’s opening, Russell Crossroads welcomed another establishment with roots in Birmingham when James Beard nominated chef Chris Hastings, of the Hot & Hot Fish Club, partnered with Russell Lands to open the SpringHouse Restaurant. Housed in a new building reminiscent of an old stone barn, we created an interior environment for the SpringHouse that is both rustic and sophisticated. We love hearing from people all over the Southeast about how much they are enjoying both Catherine’s Market and the SpringHouse! We’re pretty big fans ourselves, and feel so honored to have worked with such experts like the Littles and Chris Hastings. Just down the road from Russell Crossroads, we were busy completing a lake house this year that like none we’ve ever seen before. Cool, crisp and sophisticated, this home’s palette of charcoal, white and linen with touches of grey blue is incredibly serene and peaceful. This home has been quite popular since we first showed photos of it, appearing on several great design blogs. We think it’s an incredibly beautiful home and look forward to sharing even more images of it in the coming year. We’ll admit it, the real estate market has been slow in our hometown of Rosemary Beach, Florida and all along scenic Highway 30A for the past couple of years. In 2009 we started to see that trend shift however and we excitedly began working close to home once again. We’ve got several exciting projects already lined up at the beach for 2010 but we did complete one project this year that bears mentioning once more. Located just down Rosemary Avenue from our shop, the renovation of this home–one of Rosemary Beach’s originals–produced a stunning end result for an Atlanta family. Tracery’s Paige Schnell and Anna Kay Porch completely changed the look of this house without any major construction — carefully chosen additions to the architecture combined with a crisp paint job and a house-full of new casual furnishings from our shop resulted in the perfect beach retreat. The clean color palette and deliberate choice of new finishes proves that casual elegance is best achieved with a simple solution. If the Southern Living Idea House personifies coastal cool, the house we completed this year in Mountain Brook, Alabama’s Colonial Hills neighborhood is the perfection of chic sophistication. Designed for a fun young family with an eye and appreciation for great design, this house manages to be both beautiful and comfortable at the same time. The result of a massive 2 year-long renovation designed by Dungan Nequette Architects and our own Paige Schnell and Doug Davis, this home was totally reimagined and customized to this busy family’s lifestyle. Equal consideration was given to formal areas appropriate to the parents’ social obligations as well as the requirements of 4 children (and many more neighborhood visitors who descend on the home everyday around 3 o’ clock in the afternoon). Grey was everywhere in 2009 and we showcased the color throughout this home, accented in many places with hot pink for an unexpected twist on an otherwise monochromatic scheme. We’ve received more than few questions about the durability of a home with so much white everywhere and 4 children running around. In fact, many of the fabrics are commercial grade and regularly scrubbed with Clorox and Magic Erasers. In the kitchen, marble trimmed openings prevent dinged-up woodwork and in the Family Room and Stair, the pecky cypress walls came pre-distressed so marks and dents are no big deal. Antique oak floors help hide scratches and cement colored grout everywhere keeps showers looking clean for longer. This home proves that having children doesn’t have to mean giving up beautiful spaces. We love this home but the best part is, the wonderful family who lives here loves it even more. As 2009 comes quickly to an end, we wanted to devote our final posts of the year to some of the great things that have happened at Tracery in the past 12 months. Despite a difficult economy and slow housing market, we’ve had a great year. 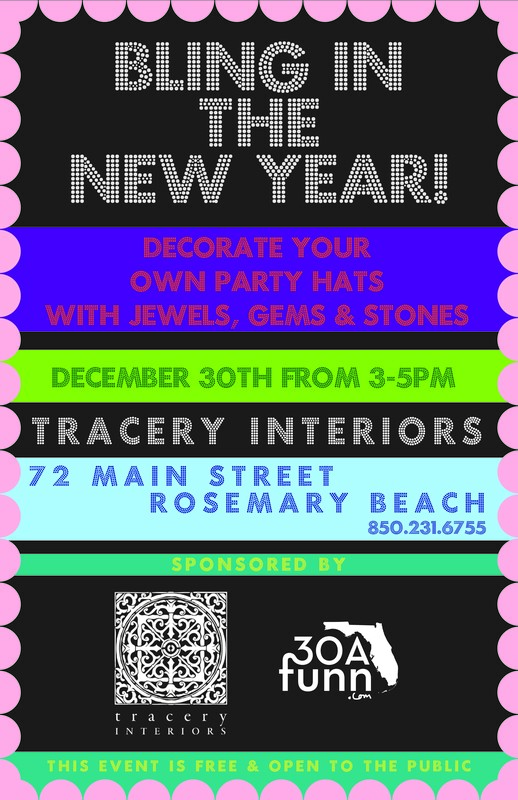 We’re so grateful for all of our wonderful clients and visitors to our Rosemary Beach shop who’ve supported us this year and helped to make 2009 a success! With shelter magazines folding seemingly every month, we felt extra fortunate to have been chosen early last year to design one of Southern Living magazine’s 2009 Idea Houses. Working with our sister companies Dungan Nequette Architects and The G Brand, we developed designs for the Texas Gulf Coast – located house that reflected a fun and laid back beach lifestyle. It’s been so exciting for us to see the Idea House show up on blogs all over the world and we couldn’t be happier that our sunset-inspired palette of colors has been so well received. The blending of clean-lined upholstery, interesting antiques and vintage pieces, with bold patterns and honest materials is the hallmark of the Tracery Style and this house exemplifies a lot of what we believe about comfortable interiors. This saffron painted barn door is probably the most popular image from the Idea House, and why not? It’s a great example of how the deliberate use of color can transform a space from ordinary to extraordinary! Speaking of popular, no post has received more traffic this year than the one we wrote about [antiqued mirror]. We never get tired of this finish. Whether providing a dramatic backdrop in a grand city house or serving as a casual kitchen backsplash in a beach home like the Southern Living Idea House, we’re proud to have helped introduce this technique to so many people this year.